I’m obligated by common sense to start with a disclaimer about not being a doctor, so I’ll start with that: I am not a doctor. However this question comes up a lot, so I’ll break down some rules of thumb and ways you can navigate pain without letting it hold you back. Also to be clear, I’m talking here about nagging aches and pains, not serious medical conditions. If you think to yourself, ‘Hmm, my X has been kind of a nuisance for a while’, I am talking to you. If you have limbs that aren’t attached anymore or there is blood coming out of something, you may need an ambulance more than this article. If you’re still here and don't look like this guy, let’s dive in. 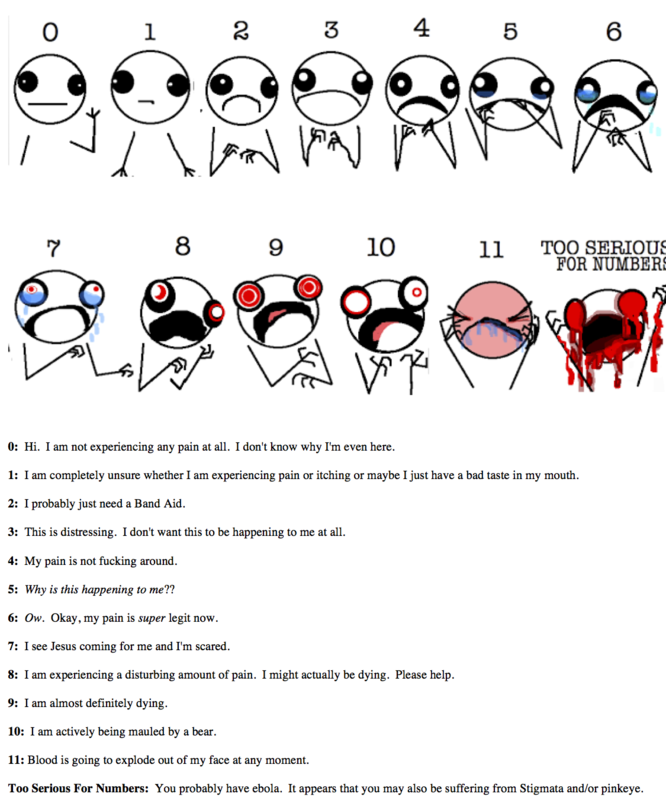 If you’re at a 5 or less (out of 10) on the pain scale, you’re probably ok to train. That being said if the pain gets worse, for example from a 2 to a 3 to a 4, as you are warming up you should probably shut it down. Focus on the other exercises you can do without pain, and you can still accomplish quite a lot. It’s a rare instance when I tell someone to skip the gym completely, there is almost always something you can do, and a sprained finger is no cause to skip a lower body exercise and vice versa. There is also quite a bit of research indicating you should still train the un-injured side with unilateral training, and it can even provide a strength benefit to the non-worked side. Kind of counterintuitive, but very cool. If it’s hung around for 2-4 months, that’s not a great sign and you should probably get it checked out by someone. So do you go to a medical doctor or physical therapist? Depending on your insurance situation I often recommend a Physical Therapist and better yet one knows how the body moves, like this guy. A medical doctor will often give you the lay-off-it-for-a-while treatment, which isn’t always helpful. You often need to treat the underlying cause which takes some time and attention to how you’re moving and training, so work with a coach to improve your movement and see if that doesn’t fix the issue. Don’t freak out. Back injuries (and lower back specifically) are super common and should be treated just as any other injury. That is, worthy of attention but also fixable. The problem is we use our back for just about everything so if you're experiencing pain, you'll feel it all the time. Not fun. Treat it seriously but keep proper movement as the primary thrust of your initial efforts to alleviate pain. Current science shows that a large percentage of the population have spinal degeneration show up in imaging but are still asymptomatic, so research and experience show this diagnosis is not a death sentence. Back surgery can sometimes make the pain worse as well, so it should be treated with caution. There's also quite a bit of evidence that your relationship to the pain can make the difference, so not freaking out is a part of an effective pain management strategy. My rules of thumb here are if the injury is hot, tingly, or sends shooting signals to other areas, that’s not a great sign and you should see a doctor. Dull, achey, muscular soreness is usually ok, although I do have to reference you back to fact that I am not a doctor. This also assumes your stabilizing your back properly which you’re probably not. If you’re back hurts and you’ve never worked with a coach before that’s a great place to start. In my experience if you’re really hurt there’s no way you’ll do something that will make it worse. I test the waters with this question, “Why don’t we try it and see?” Someone with a serious injury won’t even respond so much as go white in the face and shake their head in fear. The brain has a great way of stopping us from being truly stupid. If you’ve having a ‘should I or shouldn’t I?’ conversation in your head, make sure it’s the injury you’re considering and not just being lazy. Soreness is certainly uncomfortable and at times memorable, but I wouldn’t place it in the ‘injury’ category and it certainly isn’t a reason to skip training. Hard training can make you sore, but you shouldn’t judge the success of your training by the soreness it produces. Long term training is about making progress, ie going up in weights, and not necessarily how you feel when the work is complete. Soreness will come and go sometimes without much explanation, so consider it a normal part of training and remember the days where it requires an extra day of rest only happen every couple of years. And there you have it! My super-secret tricks for navigating injuries. They happen to all of us and if you train hard enough to make progress, you’ll eventually train hard enough to get hurt. Keep a cool head, give it the attention it needs, and you’ll be set up well to continue progress in other areas or even fix a nagging issue that’s been holding you back.